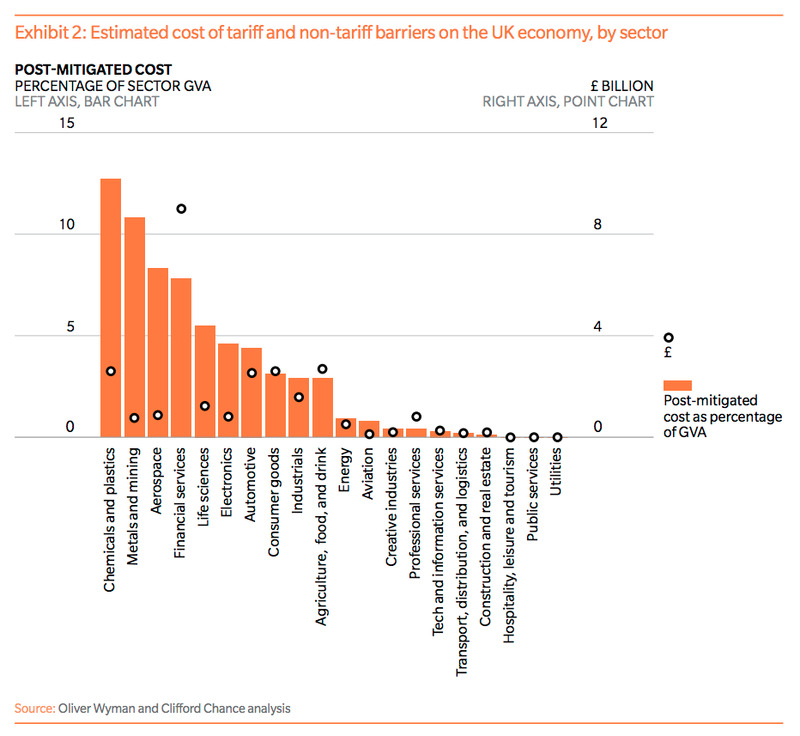 A no deal Brexit could cost UK and EU industry a combined £58 billion per year, according to a joint report from consultants Oliver Wyman, and law firm Clifford Chance. Tariff and non-tariff barriers will cost British exporters as much as £27 billion, while the cost to exporters across the EU could be £31 billion. In Britain, five industries would bear as much as 70% of the burden. LONDON – British and EU companies face a hit of almost £60 billion per year in the case of a no deal Brexit, according to a joint report from consultants Oliver Wyman, and law firm Clifford Chance. The report, titled “The red tape cost of Brexit” argues that tariff and non-tariff barriers to trade could wipe as much as £58 billion off UK and EU companies in the event that Britain leaves the EU without securing some sort of a deal. While both sides of the negotiating table remain confident of securing some sort of deal before Britain drops out of the bloc next year, the prospect that no deal is struck looms large. No deal would see the UK default to WTO trading terms, which many economists say would have a highly damaging impact on the economy through an array of tariff and non-tariff barriers on UK exporters. Those barriers, Oliver Wyman’s report said, will cost British exporters as much as £27 billion, while the cost to exporters across the EU could be £31 billion. These costs would be spread across a wide spectrum of industries, the report said, but five would bear as much as 70% of the burden. Understandably, given its inherently international nature and reliance on cross-border trade, the financial services sector would be worst hit in the UK. “The largest absolute impact will come from financial services due to London’s role as Europe’s financial centre and the fact that it will be hard to mitigate impacts in this sector,” the report says. 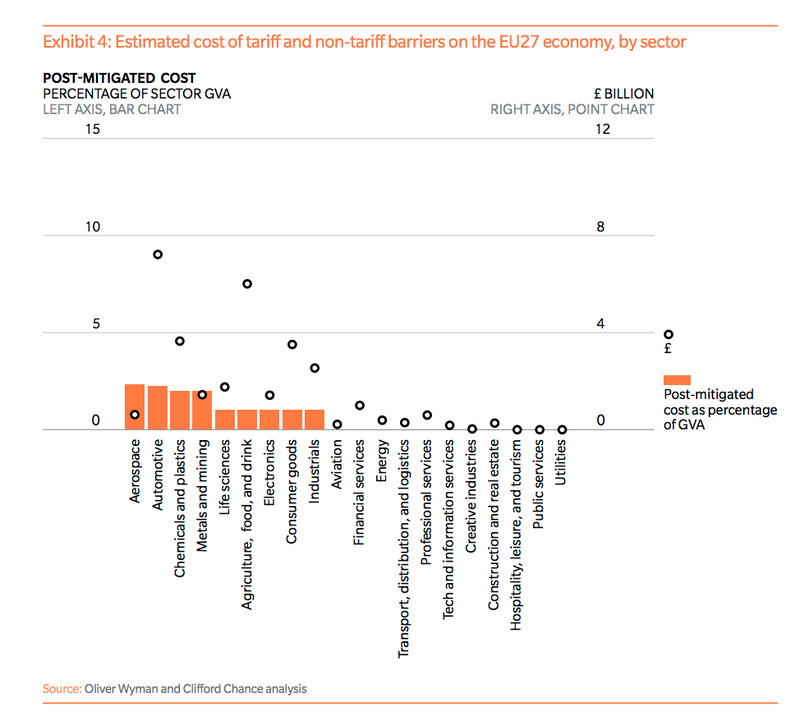 The other four industries to see the biggest hit from a no deal Brexit, Oliver Wyman says, would be cars, agriculture and food and drink, consumer goods, and chemicals and plastics. Things will look different on a country-by-country basis in the EU, the report notes.